Children are welcome to have a school lunch, to bring a packed lunch, or to go home for their midday meal. We encourage children to eat a healthy school dinner or packed lunch. A picnic lunch may be eaten outside during fine weather Opportunities for exercise and organised games exist at lunch-times, as well as unstructured, creative play. Play equipment can be borrowed from the School Council shed. A quiet area is a haven for more sedentary activities. The library is open at lunch-times for reading, research and ICT activities. Help with homework is available from our librarian. Supervision, play opportunities and first aid are provided by our highly trained staff. Children are expected to have a change of shoes to wear outside to protect our carpeted areas. A Behaviour Code is operational during lunch-times. Good quality school meals are prepared and cooked on the premises from fresh ingredients in accordance with national nutritional standards. Menus are displayed on the school notice board and on the website and include a vegetarian option for each day. If your child has any specific dietary requirements please contact the school caterer via the office. The current cost of a school meal is £2.15. Lunch money is payable in advance and if possible should be paid for half a term at a time, as this saves considerable time and administration costs. The easiest way to pay and keep track of your child’s dinner money balance is through our secure online payment system ParentPay. If you do not have login details please ask at the school office. If you do pay by cash or cheque they should be sent to school on the first day of term and thereafter on a half-termly basis in a sealed envelope, clearly labelled with the child’s name and class. Cheques should be made payable to Mayfield Primary School. If payment is made on a weekly basis it should be sent in regularly each Monday. It is helpful if families with more than one child taking school lunches send payment in a separate envelope for each child. Some children are eligible for free school meals, e.g. if their family is in receipt of income support, jobseeker’s allowance, support under the Immigration & Asylum Act or child tax credit (but not family tax credit). 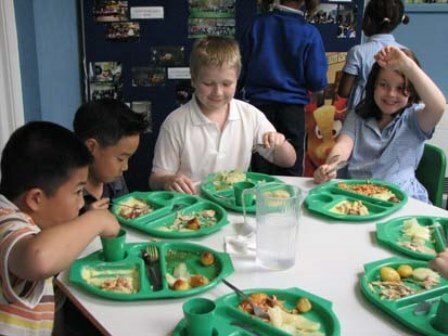 If you think your child may be entitled to free school meals contact the Education Welfare Benefits Service 01480 372307 or 372308 or apply online at the county council website Primary Free School Meals Cambridgeshire. Click HERE for the spring/summer menu from our caterers, Aspens. As part of the curriculum the children learn throughout their years at school about what makes a healthy balanced diet. We encourage them to apply those ideas to their lunchboxes, so that they get the protein and carbohydrates they need together with fresh fruit and vegetables, and avoid foods which are high in salt or fat. We have a ‘no sweets‘ rule. During the summer of 2006, Mayfield ran a ‘Design a Healthy Lunchbox’ Challenge that many children contributed ideas and recipes for. These, together with ideas adapted from some other sources, became the Mayfield Healthy Packed Lunch Recipe Book which you can download from the link below. It can be difficult to think of interesting and nutritious food to put in a packed lunch every day, so we do hope you will find some new ideas in this booklet and that it will help you make your child’s packed lunch a healthy and nutritious meal. 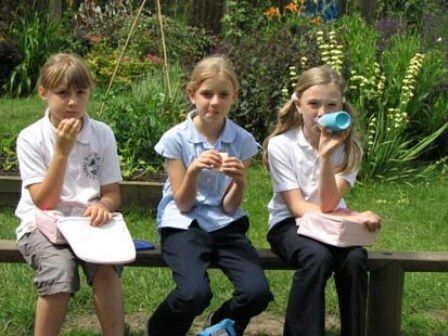 Children eating packed lunches may eat in the dining hall or, in the summer, in the school grounds. Please avoid cans or breakable containers e.g. glass bottles in packed lunches. As an eco-school we are keen to cut down on waste packaging and to compost fruit peelings etc. All infant children are eligible for a daily piece of fruit or vegetable through the National Fruit and Vegetable Scheme. If Juniors require snacks at playtime, we encourage them to bring fruit. All children are encouraged to drink from a water bottle during the school day, and may refill it from the filtered drinking water tap in their classroom if required. Water bottles are available from the school office for £1.